A book about Freemasonry by a man who also writes about Asatru. That could be something for these pages, right? Henning Klövekorn was born in Germany in 1975, lived in South Africa, but now lives in Australia. Klövekorn joined an Australian lodge in 1997 (age 22). Nine years later the first edition of this book was published. Both this edition and the reprint became so popular that high prices are asked for copies, so in 2015 the author decided to make a print-on-demand version to ensure its accessibility. Besides being a Freemason Klövekorn is a successive businessman, philanthropist, diplomat and in spite of all this success, openly Asatruar. The book even features a photo of him with a square and compass with two runes in the middle instead of the usual letter G. So would this book fulfill the promise of Klövekorn’s “[w]ork on the Anglo-Saxon of the origins of Freemasonry”? In a way, but not really in depth. Actually, the book is a fairly general introduction into Freemasonry. What is different about this book from most similar books, is that it is not limited to so-called “regular” Freemasonry. The author also sketches the the rise of ‘progressive’ forms of Freemasonry. Also he gives information about kindred organisations, such as “friendly societies”, other “fraternal societies” (other from Freemasonry), an idea of the wealth of exotic Rites and ‘high’ and ‘side’ degrees, developments within the world of Freemasonry, some history of course and a part of Freemasonry that usually gets less attention, the charitable side of especially Freemasonry in the USA and the UK. At the end there are a few words about Masonic symbolism in art and monuments of Freemasonry. There are almost 30 chapters which are fairly short. The book touches on a lot of different subjects, but does never really go into any depth. The author’s ‘Anglo-Saxon thesis’ is only touched upon, so maybe the “about the author” refers to another book. What seems to be the basis of this approach is that Freemasonry not only came to the British isles by fleeing Knights Templar, but also by Norse settlers from France who brought with them memories of Northern European life. Also there is a chapter about very early (1250) Freemasonry in Germany. I think that “regular” Freemasons may not always be too happy with this book, but this is all the better for the many ‘progressive’ kind of Freemasons in this world. I do find it a bit weird that the mixed gender order Le Droit Humain is listed in the chapter “Related and Rival orders” between the Thule Society and the Bavarian Illuminati, while there is also a chapter about women in Freemasonry and Le Droit Humain is a Masonic society. Also strange, even though this is a third edition, there are some strange errors, such as an alinea that is printed twice and some information that has not been worked out too well so it can cause confusion. Should you enjoy reading the long lists of elaborate names of high degrees, this book is for you too. The author also deals with the basic symbolism behind a list of degrees. 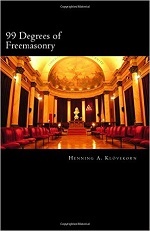 “99 Degrees of Freemasonry” makes a nice introduction into the subject, but it is not really more than an introduction. It touches upon elements of ‘Masonic myth’ such as Egyptian origins, Knights Templar, etc. Hopefully the book is meant as a step-up to a better foundation of the more ‘controversial’ elements that Klövekorn seems to try to get across. Also it is nice to run into a book that does not shy some less popular angles on the subject. Since it is not expensive (under $ 20,- when you get the printing on demand) this title might be added to your wishlist.